I think it’s safe to bet that no one has even seen Mr.G. and Mr.D. sport that same, “WHA…! ?” expression before…. at the same time, no less. The Devil’s in the details indeed. The Devil may be in the details, but THESE details are going to be-Devil him! Well, considering that the contract with the Devil that the Imps were bottled for was for a man, in the Media industry, I would say that yes, a few rules got broken delivering them to someone who hadn’t sold her soul. hmmm me thinks we have not seen the last of mr butterpaws and the blame game………….. Anybody else remember Shel Silverstein’s “The Devil and Billy Markham”? The extended version, with the bit where the Devil grants that for 24 hours no creature can deny Billy’s requests to make whoopie? Remember who Billy asks last? I knew they’d find a loophole! 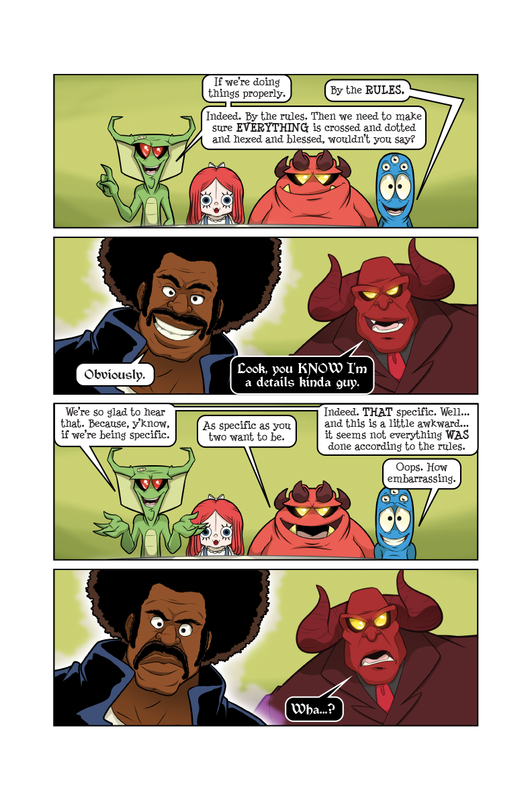 Hey….you can’t beat the devil on a technicality! Technicalities are his stock in trade! Uh .. that Raggedy Ann dolls stare is seriously freaking me out.